Samford University launched a month-long series of Black History Month events with a Feb. 4 convocation featuring Priscilla Hancock Cooper, vice president of institutional programs at the Birmingham Civil Rights Institute. Several hundred students and employees attended Cooper's presentation. 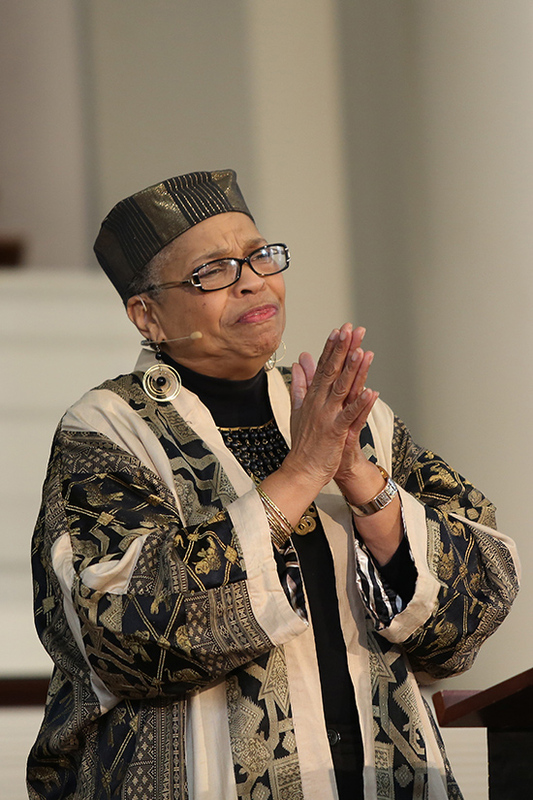 Following the month's theme of "In Spirit, In Action: A Celebration of Black History Month," Cooper shared poems, prayers and spirituals along with commentary on the history of the civil rights movement and freedom in America. Sharing pieces like "Black Mother Praying" by Owen Dodson and "We Wear the Mask" and "An Ante-Bellum Sermon" by Paul Laurence Dunbar, Cooper presented a historical and artistic look back at the Civil Rights Movement in celebration of the 50th anniversary of the 1964 passage of the Civil Rights Act. "The amazing thing to me is that [the Civil Rights Act] has in fact changed the way we view ourselves as Americans," said Cooper. In her closing, Cooper encouraged students not to take their freedom lightly with the question: "What will you do with your freedom, now?" Cooper is also a notable poet, author and teacher, and in 2005 was awarded the Individual Artist Fellowship in Literature by the Alabama State Council. She also received the Coming Up Taller Award by the U.S. President's Committee in the Arts and Humanities in 2006. Cassady Weldon is a journalism and mass communication major and a news and feature writer in Samford's Office of Marketing and Communication.